Ensure you opt-in the Impression Integration, enabling Google Display Network Impressions and Rich-Media interactions to be automatically added to your path data through the AdWords linking. Don’t forget to also check out the recorded webinar from Bill Kee, Product Management Lead for Attribution, providing more details on how to create a custom model. In the admin section you can now look at your personal tools & assets. 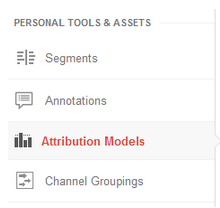 The newly created model will show up in the ‘Attribution Models’ section. You can find custom channel groupings you created under Channel Groupings. The table shows all assets available, and a drop-down allows you to ‘share’ these assets through a link. Step 3 - Share the Link - Done! From the drop-down Actions menu select ‘Share’, and a permanent link to the configuration of this object is generated. This link will point to the configuration of the shared asset, allowing anyone with a GA implementation and the link to make a copy of the asset config, and save it into their instance of GA. You maintain complete control over who you share your assets with. Include the link to your brand-new attribution model asset in an email, IM message, or even a Blog Post, such as this one.